City barracks with church in Ruzovsky street, St. Petersburg. His Majesty Lifeguard Regiment (Russian: «Лейб-гвардии Егерский Его Величества полк»), short also Lifeguard Jaeger Regiment (or: LG Jaeger Regiment), was a Jaeger regiment of the Russian Imperial Guard from 1796 to 1917. The history of the LG Jaeger Regiment began in the year 1792 with the introduction of a new branch of service – the light infantry – under the leadership of Paul I of Russia. This new service branch was named Jaeger… (ru: Егер… in reference to the German noun Jäger) and in relation to the development of the European armed forces. The first step was to identify appropriate personnel among the so-called Gattchino troops (ru: Гатчинские войска / Gatchinskie voyska) in Gatchina and Pavlovsk, and to concentrate this staff in separate Jaeger companies under the command of Major Anton Rachinski. End of 1793 there was the first restructuring, followed by the new formation in 1794. The innovative uniform of the jaeger, from green camisol, was different to uniforms used before. By highest of all order from November 20, 1796, all units of the Gattchino troops received the status "Old guard" (ru: старая гвардия). The hitherto separate Jaeger companies were further concentrated to a jaeger battalion, strengthened by a third Jaeger company. The already existing guard regiments, the Semjonov LG Regiment and the Ismailov LG Regiment, as well as the new LG Jaeger Battalion were put under a common command. Since that point of time, November 20, 1796 was dedicated as the official day of foundation. Anton Rachinski, in the meantime promoted to podpolkovnik, became the first commanding officer of the LG Jaeger Battalion. In 1800, prince Bagration, Pyotr Ivanovich, replaced him. In order to strengthen the battalion, a third Jaeger company was added. During the battle of Austerlitz, the young Jaeger Corps received their baptism of fire and approved extraordinary combat strength. On May 22, 1806 the personnel strength of the battalion was doubled and renamed as LG Jaeger Regiment. It was linked up to the connection of a third battalion, in order to provide a further strengthening. 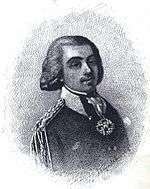 In 1809 Polkovnik Karl von Bistram became the new commander. Involving heavy losses during the Russo-Turkish War (1877–1878) in the battles against the Turkish Army, close to Varna, on September 10, 1828, the second battalion had to be re-established. In this connection sub-units of the 13th and 14th Jager Regiment were reallocated. During a holy memorial service on the battle area to Kulm in the year 1835, Nicholas I of Russia in person was evaluating the extraordinary merits of the LG Jager Regiment. In this connection the day of the Saint and martyr Miron, August 17, was selected to holyday or "great day of the regiment". From this point in time Miron became the patron saint of the regiment, and in 1854 the regiment´s church received his name. In 1855 the regiment was renamed to Lifeguard Gatchinski Regiement. However, this decision was cancelled on the occasion of the great day of the regiment in 1870. With the drawing up, the LG Jaeger Regiment was situated in the Semyeonov barracks in the street Svenigorodskaya ulitsa (later: Old Jaeger-street; Starojaegerskaya ulitsa). Afterwards it was relocated to the especially new built New Jaeger Barracks in the street Rusovskaya ulitsa, № 14, № 16 und № 18. 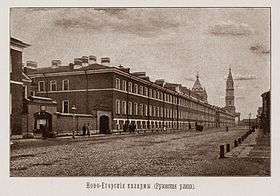 The winter barracks of the regiment, the so-called "Petersburg quarters", were located closely to the Semyenov place. The Guard Jaeger received, as it was common tradition in Russia, an education in the spirit of submissive nature. Therefore, liberal ideas were almost unknown in the officer corps. The prosperity of the regiment was subject to individual decisions of the sovereign power. So was the decision, to build a regiment church, a mark of favour of the royal family. The church was consecrated to "Saint and martyr Myron". 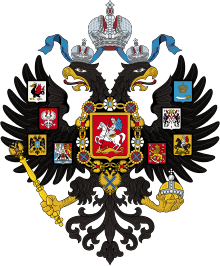 Emperor Nicholas I of Russia financed the building from the Privy Purse. The Church of the LG Jaeger Regiment to the Saint Myron was located close to the riverside of the Obvodnyi canal, near the estuary to the Vvedenskiy canal. It was established from 1849 to 1854 in memory to the victory of the coalition forces of Russia and Prussia in the Battle of Kulm against Napoleon, August 17, 1813, and the day of Saint Miron. 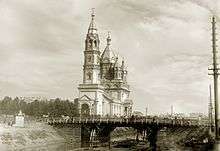 The church was built to plans of the architect Konstantin Thon. Distinguished staff of the regiment were laid to rest there. The church also served as a war memorial to the fallen in World War I. However, in connection to the suppression of the Russian Orthodox Church the Church of the LG Jaeger Regiment to the Saint Myron was used as a storehouse up to 1930. In 1934 the already-damaged building was blown up. Today, on the untilled particular area is only a carwash. In line with plans of city fathers and the church the historical regiment church is to be reconstructed in accordance with the original documents. The table below contains the regiment´s chiefs or honour commanders from 1796 to 1917. The LG Jaeger Regiment participated in the Napoleonic Wars, Russo-Turkish War of 1828–1829, the campaign to put down the November Uprising in Poland in 1830-31, Russo-Turkish War of 1877–1878 and First World War. The table below contains extracts from the combat calendar of the regiment. The table below contains a selection famous people, who served in the 'LG Jaeger Regiment. Aleksei Antonov — General of the Army, member of the supreme command, Chief of General Staff 1945-46, 1st CS of the coalition armed forces of the Warsaw Pact member states. The table below contains the commanding officers of the regiment. ↑ Убит 10 сентября 1828 года в бою при Гаджи-Гассан-Лар.